Anytime provides an on-demand support service to over 50 local authorities covering a wide range of work packages. 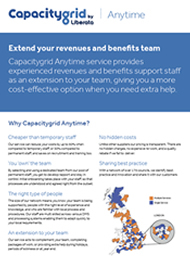 It provides experienced revenues and benefits staff as an extension to your team, giving you a more cost-effective option when you need extra help rather than relying on temporary staff, all of whom have experience of working on all the core host systems. Using the scale of our network we offer a flexible solution, helping you get back on track in challenging times, particularly if workload volumes increase during peak holiday periods, in the event of unplanned sickness absence or during restructures to aid cost saving challenges. We can also reduce your team’s workload by automating ATLAS. If you need professional, experienced revenues and benefits practitioners to help you cover a busy time, contact us to find out more.